Phyllis Gaylard asks her friend Pamela Strong how to encourage women to pursue aerospace engineering. Gaylard, aerospace engineer and Strong, a rocket scientist, are both Fellows of the Society of Women Engineers. 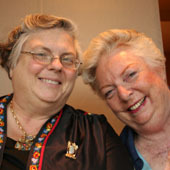 Strong was the recipient of the 2007 SWE Achievement Award. This recording is Clip 3 of 4. Click on the "Gaylard / Strong Interview" link above to find all clips from the interview. Click on the "2007 StoryCorps Interviews" link above to find all audio recordings from the interviews. This oral history interview was recorded October 26, 2007 at the Society of Women Engineers WE07 National Conference in Nashville, TN as part of StoryCorps (www.storycorps.net), a nationwide initiative of Sound Portraits Productions to record and collect oral history interviews. This excerpt was selected and produced by the SWE Archivist. Audio excerpts may be used for research and educational purposes only.